If you love Taco Bell, don’t miss this deal! 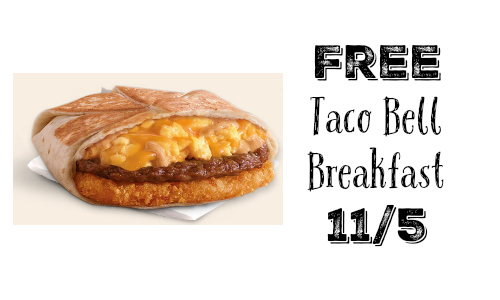 You can get a FREE Breakfast Crunchwrap at Taco Bell on 11/5. The deal is available from 7 am -11 am. You can now order Taco Bell on their new free mobile app and get 50% off your order when you use Visa Checkout. To get 50% off, download the app, click on Offers, then Sweet Deals and then click on Visa Checkout Offer. Max discount is $10. Deal ends 11/2.